Tonight was the big showdown. The first (and probably only) public debate between the diminutive incumbent, Congressman John Adler, and the leviathan ex-footballer Jon Runyan. Following the candidates’ opening remarks, the event was conducted in three parts. First, a panel presented questions to each of the candidates. Then each candidate presented questions to his opponent (these questions were prepared in advance), and finally there was an opportunity for the audience to question the candidates directly. The panelists consisted of Dr. Myra Gutin of Rider University (who, by the way, is a nationally recognized academic on the topic of First Ladies), Leon Tucker who is managing editor of the Courier Post, and Julia Roberts (no, not that Julia Roberts) who is the chair of the young adult division of the South Jersey Jewish Federation. 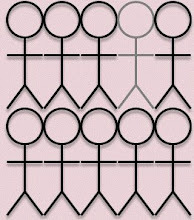 The positions of both men are well known, especially Adler because he has a voting record from his first term. Adler cited his experience by name-dropping of many of the people he’s talked with in his short career on the Hill – from Barack Obama to Ben Bernanke to General David Petraeus to Benjamin Netanyahu. Runyan touted his “tenacity” on the football field. I’ll highlight some of my impressions in areas that may not have received full coverage or where there are significant differences between the two candidates. Government Spending. Unsurprisingly, both candidates were in favor of cutting government spending. They were asked to name specific areas where this could be accomplished. Runyan’s answers were very Christie-esque – across the board cuts to 2008 spending levels without consideration of priorities or changes to the external environment. He would cut out (unspecific) waste and espoused that there are a number of “simple solutions” to getting spending under control like capping government pay and cutting back the number of government employees (although he did not specifically say where). Adler cited instances where he voted for or would support cuts including agribusiness subsidies and repeal of the advanced income tax credit. The congressman proudly announced that he voted against eight of twelve spending bills. He proposed bringing all troops back home from Iraq – including the 50,000 we have there now – to help with the spending problem. Energy. Adler is adamantly against offshore drilling from New Jersey to Virginia and is a proponent of wind farms and nuclear power. Runyan said that offshore drilling is a tenth amendment states’ rights issue and the Federal government does not have the right to regulate offshore drilling. Israel and Iran. Both candidates are staunchly pro-Israel and would take action to prevent Iran from becoming a nuclear power. Neither ruled out military action against Iran, but Alder would consider a naval blockade before air strikes. He said the Senate has been dysfunctional on this and many other issues. Runyan said “nothing is off the table” with regard to military action against Iran. On the conflict with the Palestinians, Runyan said the United States should stay out of it and not pressure the two parties into anything. Adler pointed out that a two-state solution is unrealistic in the short term because there is no one to negotiate with. He said that the Palestinian Authority must unequivocally support Israel’s right to exist before negotiations begin. Runyan is in favor of moving the American embassy to Jerusalem. Adler pointed out that this would have deleterious ramifications, and we should work this out with the Israelis. Second Amendment. Adler said that certain weapons such as bazookas and machine guns should not be available to private citizens and that such bans have been upheld by the Supreme Court. Runyan is not in favor of any limitations on weapon ownership. Education. A question on education funding was asked by a Lenape High School student who was subsequently booed by the Tea Party contingent in the room. Runyan stated that it is the personal responsibility of parents to “educate their child at home”, although I don’t think he was espousing universal home schooling. Adler pointed out that his four children attended public schools and claimed “public schools are the key to America’s future.” Neither candidate offered substantive solutions. Health Care. Adler said that even though he voted against the Affordable Care Act, he would not vote for repeal. Instead, he would promote fixing those areas that he feels need improvement such as cost containment. On Medicare, he pointed out that physician reimbursement needs to be increased in order to keep more doctors in the system. Runyan said he would vote for complete repeal of what the Tea Party calls “Obamacare”, although he then backtracked and said the ban on rejection for pre-existing conditions was a good idea. Overall, Adler continued to hammer the fact that he is a centrist (he used the word “bipartisan”), even pointing out an instance where he co-sponsored a bill with right-wing extremist Scott Garrett. 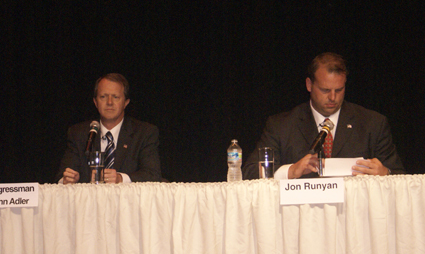 Runyan’s main points were anti-tax and small government. In response to one of the many questions posed by Tea Partiers, both men agreed that President Obama is neither a Muslin nor a Socialist. With the exception of the abortion issue, Runyan toes the Tea Party line completely. He is in favor of the failed Bush economic policies and “nuance” and “compromise” don’t seem to be in his vocabulary. Adler is the “centrist” he claims to be – what we used to call a “moderate Republican”. We have a clear choice in November. Yes, Adler is the lesser of two evils, but I’d rather be represented by an intelligent and independent thinker than an ex-footballer who is proud of his Tea Party endorsements. The bottom line is that for progressives, Adler is a flawed candidate. Runyan is a dangerous one.